This will be a process that focuses on managing the natural environment for the provision of all environmental assets including water quality, water flow (quantity of water in the environment), natural habitats for land and water based plants and animals, regulation of the climate (e.g carbon sequestration) and recreation opportunities (e.g fishing, sailing) The creation of a plan that leads to genuine integration of resources necessitates process above. Essentially, we need to identify what are the key environmental assets (or ecosystem services) that are provided within our CaBA area and which aspects of this area (e.g habitats, soil types, typography, land uses) are most important, or have the most potential, for providing each of these services. 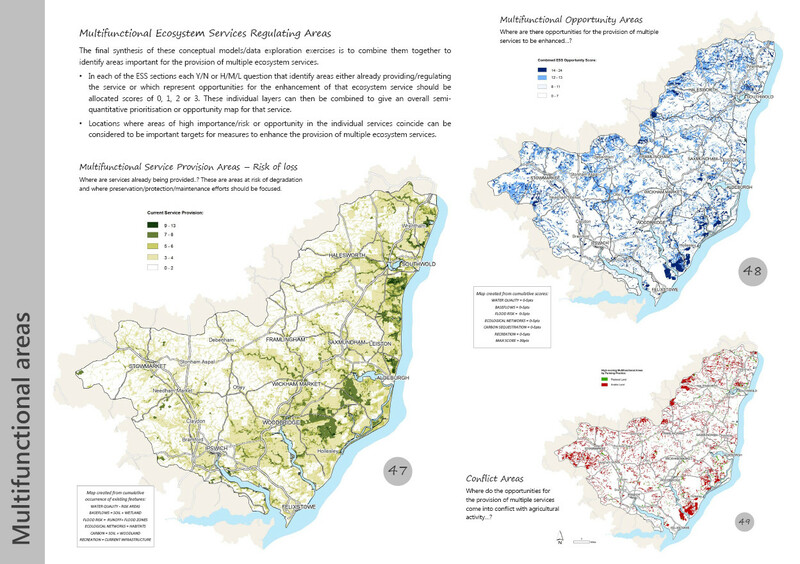 Geographical areas capable of delivering multiple ecosystem service enhancement offer particularly attractive opportunities. We can then target efforts geographically to assist the delivery of these ecosystem services where they are regarded as depleted. The above activity will generate a map of the CaBA area detailing where the least number of land management and land use interventions can deliver most benefit to the greatest number of ecosystem services. Point source pollution is a feature of nearly every catchment in the UK and is not influenced by land management activities or land use per se. It is a discrete topic in its own right, requiring bespoke assessment and site specific interventions. Strand 3. Review of recreation activities, green infrastructure provision and intervention development Human beings undertake a variety of recreational activities in river catchments including pursuits as broad as angling, walking, riding, wildfowling, cycling, canoeing and sailing. There is a growing demand for some of these activities. Local Authorities are also under pressure to create enough ‘green infrastructure’ within their jurisdictions to ensure local communities have access to sufficient space to meet their recreational needs. Each of these recreational activities is being provided by the natural environment and, as such, they can be considered a form of ecosystem service the management of which needs careful consideration alongside the provision of other ecosystem services e.g provision of water quality or space for wildlife. An intervention to improve access for cyclists through a wood might be good for cyclists but it might disturb wildlife and cause soil erosion which impacts negatively on adjacent watercourses. Strand 4. Public/Business engagement planning and intervention development There is a great deal that members of the public and businesses can do through their everyday behaviours to protect the natural environment within the CaBA area. Failure to engage the local community and businesses is cited as a key reason why environmental management plans have often failed in the past.